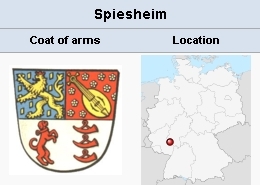 Spiesheim, a village near Alzey in Rheinland-Pfalz, Germany, formerly belonging to the Palatinate, in which there have been Mennonites since at least 1661. In that year Wendel Holl of Wolfsheim asked permission for the few Mennonites who were living in Bermersheim, Spiesheim, and Aspisheim to hold meetings. The lists of the Generallandesarchiv of Karlsruhe name three Mennonite families living in Spiesheim in 1664: Johann Bliem, Christian Weber, and Wilhelm Ham (Hahn?). In 1685 there were five families: Severin Ham, Matthes Becker, Wilhelm Mäurer, Joh. Bliem, and Heinrich Bliem. In 1738 the lists name the families of Heinrich Hahn, Johannes Weber, Peter Berg ("the young and the old"), Dietrich, Daniel, Heinrich, and Julius Blum, and also Julius and Heinrich Biehn. In 1752 the heads of the families were Peter Berg ("the young and the old"), Julius Biehn, Dietrich and Daniel Bliem, Heinrich Hahn's widow, Johann Jakob Hüthwohl, and Johann Weber. In 1759 there were only Julius Biehn, Johann Weber's widow, Peter Berg, Heinrich Biehn's widow, and as a new name Peter Jansz. The last list of names, 1768, also names five families: Julius Biehn, Hermann Biehn, Peter Jantz, Johann Schmidt's widow, and Peter Berg. A summary of 1773 counts five families with a total of five sons and eight daughters. In 1732 the Mennonites of Spiesheim still belonged to the Wolfsheim congregation. After the Wolfsheim congregation disbanded, Spiesheim apparently merged with the neighboring Wallertheim. The union existed until at least 1810, for a document left by Johannes Borkholder of Wallertheim shows that he was chosen as preacher of the joint congregation in 1808, and as elder in 1809. The relation of Spiesheim to the neighboring churches is not clear. In the Dutch Naamlijst of 1766 Oberflörsheim, Spiesheim, and Griesheim are listed as one congregation with Christian Weber as elder (from 1728) and Wilhelm Krämer, Johannes Schörger, and Henrich Müller as preachers. The Naamlijst of 1767 lists each of these three congregations as more or less independent, Johann Schörger and Wilhelm Krämer (1748) being the preachers at Spiesheim, while Christian Weber (preacher 1725, elder 1728, died 1771) of Oberflörsheim still served as elder of the three congregations. The Naamlijst of 1775 lists Johann Schörger, Henrich Müller (1759), and Gerhard Berg (1772) as preachers at Spiesheim. Müller and Berg died in 1790 and were followed by Johann Borkholder, the father of the above, and Abraham Hertzler. Shortly after 1775 Johann Schörger died and was followed by his son Andreas Schörger who served until circa 1783. In the Naamlijst of 1786 and later Spiesheim-Wallertheim is listed together with Erbesbüdisheim and Weierhof, Jacob Galle of Erbesbüdisheim being the elder of this group of congregations. This situation lasted until 1791, when both preachers of Spiesheim-Wallertheim were ordained as elders and this church became independent. As a contribution for the erection of a new church in Altleiningen Hermann Biehn of Spiesheim sent 6 florins and 9 kreutzer from the Schniftenbergerhof congregation and 12 florins from the Spiesheim and Wallertheim congregation to Valentin Kramer in Oberflörsheim. Johann Borkholder signed the resolutions of Ibersheim for the Wallertheim (Spiesheim is not named) and Rheingrafenstein congregations in 1803. In the course of an interesting school dispute between the Mennonites and the government of Hesse, which was fought out especially by David Kaege, of Offstein, other Hessian Mennonite congregations also stated their position. A letter of this kind written to the government of the province of Rheinhessen in December 1828 was signed by the following: for the Spiesheim congregation—Peter Berg and Johannes Berg, preachers; Johannes Schmitt, Vorsteher; and Peter Bien; for the Wallertheim congregation—Christian Hegi, Jakob Schowalter; for the Uffhofen congregation—Jakob Galle, preacher; Jakob Steiner. This seems to indicate that there were three independent congregations. But this can have been the case for only a short time, for in 1829, when a small church was built in Uffhofen, first Wallertheim and then Spiesheim joined the Mennonite congregation in Uffhofen; the latter are still members there. Jakob Weber of Spiesheim was the last lay preacher of the congregation. After the Weierhof congregation became responsible for the services at Spiesheim he probably served only on certain occasions. In February 1852 a Mennonite funeral was held in the town church in Spiesheim, which had been built a few years previously with the aid of Mennonite contributions. Since no trained minister was available, a lay preacher, probably Weber, was about to preach the funeral sermon, but was told that he must preach from the altar, and not from the pulpit. On 27 February he wrote a vehement protest to the pastor at Ensisheim, asking either that such restrictions be removed, or that the contributions made by the Mennonites be returned to them. After a correspondence of six months the matter was apparently settled to Weber's satisfaction; the payments made by the Mennonites were not refunded, on the ground that they had used the church six times in the eight years. An instance of gross intolerance had occurred at Spiesheim about 150 years earlier when the lay preacher Chiles Hahn was fined ten talers for preaching a short funeral sermon in the local Catholic cemetery (see Burial, Funerals). Two instances of the enforcement of the right of redemption (Jus Retractus) illustrate the lack of protection and legal status of the early Mennonites. In 1732 Johann Weber, a Mennonite, had bought some land at a public auction for 152 florins. A few days later another claimed the right to the land. The Mennonites under the jurisdiction of Alzey made a united appeal to the elector, but to no avail. In 1736 the dispute flared up again in Spiesheim, when a vineyard was claimed in this manner after it had been in Mennonite possession for ten years. This time, however, the elector required the local government to return it to the Mennonites and imposed a fine of 10 talers on the local authorities. In the late 1950s there were in Spiesheim five Mennonite families and a few single persons, with the old names of Berg, Schmidt, and Weber. A Beutler family moved in from Sembach in 1875. Hege, Christian and Christian Neff. Mennonitisches Lexikon, 4 vols. Frankfurt & Weierhof: Hege; Karlsruhe: Schneider, 1913-1967: v. IV, 221-222. Schowalter, Paul. "Spiesheim (Rheinland-Pfalz, Germany)." Global Anabaptist Mennonite Encyclopedia Online. 1959. Web. 22 Apr 2019. http://gameo.org/index.php?title=Spiesheim_(Rheinland-Pfalz,_Germany)&oldid=146256. Schowalter, Paul. (1959). Spiesheim (Rheinland-Pfalz, Germany). Global Anabaptist Mennonite Encyclopedia Online. Retrieved 22 April 2019, from http://gameo.org/index.php?title=Spiesheim_(Rheinland-Pfalz,_Germany)&oldid=146256. Adapted by permission of Herald Press, Harrisonburg, Virginia, from Mennonite Encyclopedia, Vol. 4, pp. 594-595. All rights reserved.